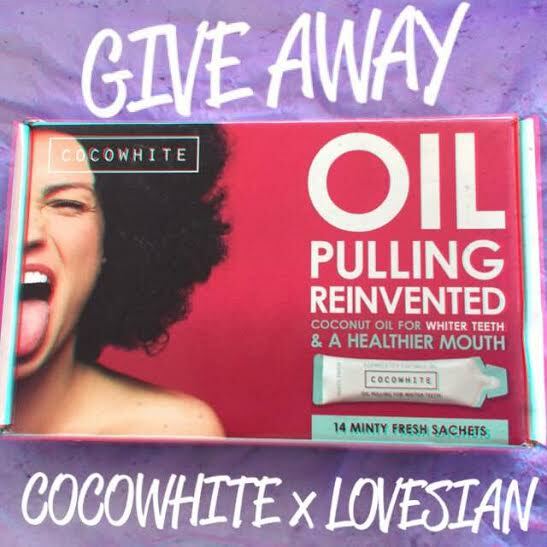 One of my favourite fashion and beauty bloggers Sian Peters, has teamed up with trendsetting brand Cocowhite to give you the chance to get your hands on some sought-after products… for free! Cocowhite is the new health brand that the beauty industry can’t get enough of. They’re created a convenient and healthy way to whiter teeth in just one little package. Taking the traditional method of oil pulling, which involves swishing oil in your mouth for nearly 10 minutes to reduce bacteria and whiten teeth, Cocowhite provide the perfect dosage in handy little packets so that you’re good to go! Each box contains 14 sachets to be used over 14 days and LOVESIAN has got her (perfectly manicured) mits on some to give to you! Oil pulling might sound a little scary, but it’s a proven natural way to whiten teeth. It reduces the amount of harmful bacteria in your mouth and fights plaque (a biofilm of bacteria on the teeth)! Plaque isn’t your friend- it discolours teeth and leads to bad breath and can even cause gum inflammation. When oil pulling, this harmful bacteria gets stuck in the oil and dissolves. Simple!